Editor's note: Morgan Tsvangirai is president of the Movement for Democratic Change and former prime minister of the Republic of Zimbabwe. The views expressed are his own. Zimbabweans were sincere in congratulating Nigeria in becoming Africa's leading economy earlier this year. We applauded its citizens and its leadership for overseeing the successful restructuring of their economy, and its subsequent ascendance to lead the continent in the global marketplace. But we also looked at Nigeria's achievements and wondered how we, too, might be able to achieve such heights. After all, we have done it before. Yet such aspirations also raise serious questions about our ability to meet them, doubts that will only have been stoked by elections last summer. Last July, Zimbabweans calmly lined up for hours at polling booths across the country, united in embracing their democratic right and duty to vote for their country's future. But the official results did not appear to reflect the nation's collective will, prompting a weary shrug of the shoulders from the international community. So, would the rest of the world be justified in losing hope in Zimbabwe's ability to change after another far from perfect election? The answer can be found in the progress that the country has made, progress that might surprise the casual observer. Between 2008, which saw the establishment of the historic coalition government that I joined with President Mugabe's ruling Zimbabwe African National Union-Patriotic Front, and last July's election, Zimbabwe made significant progress. Six years ago, hyperinflation and directionless leadership had devastated our way of life. The country's store shelves were empty, food was scarce, violence was rampant and the continent's former bread basket was now widely dismissed as a basket case. Sadly, progress stalled in the wake of the uncertainty that came with last year's election. But despite such uncertainty, Zimbabweans still understand that the country must assuage international concerns of instability and a lack of government oversight if it is to continue on the path of reform. Which areas of the economy are ripe for the kind of global partnerships, integration and growth that Zimbabwe's economy needs? Mineral procurement, agribusiness and telecommunications are, contrary to what many might think, fields in which Zimbabwe has long excelled, and are areas in which Zimbabwe has the potential and capacity to exceed expectations again. But achieving the kind of accountable and modern corporate governance that the country needs, rather than the forced indigenization and patronage too often practiced, will mean the country's politicians abandoning the mudslinging and infighting that has blighted politics here. But ultimately, if Zimbabwe wants to achieve sustainable development, this country's politicians will need to look beyond the petty politics that have continued to hinder this country. After taking a step backward with last year's election, Zimbabweans must now allow themselves to be inspired by Nigeria's economic achievements, rather than pigeonholed as a hopeless cause. If the "leaders" are that corrupt, don't the people know what to do? You are right Joey. They should form their own tea party. Then elect a black version of Sarah Palin. Then build a nascar track and a trailer park. What would you have the people do Joey? The Zimbabwean people are a peace loving people that would rather put up with "tyranny" than engage in a civil war that will destroy the little infrastructure that is left intact... Would you like to Zimbabwe turn into another DRC or Senegal? No thank you – the answer to the Zimbabwean problem does not lie in violence or a coup. Furthermore Tsvangirai is as corrupt as the "leaders" that he is criticising now... During his 5 year tenure as PM he had no problem at all eating at the same table with these "leaders" It is only now when he has been left out in the cold that he is starting to make any noise. He had his chance to turn things around from inside the State machinery and he failed. Zimbabweans are not blind – Tsvangirai is also showing despotic tendencies, he doesn't even know the first thing about the Democracy he is preaching about. The Zimbabwean people were as ignorant of the democratic changes necessary for free and fair elections as Tsvangirai and hence the reason why they failed to force MDC to get them implemented. We are talking of being ignorant and not knowing what is in their own interest; that has nothing to do with peace loving! 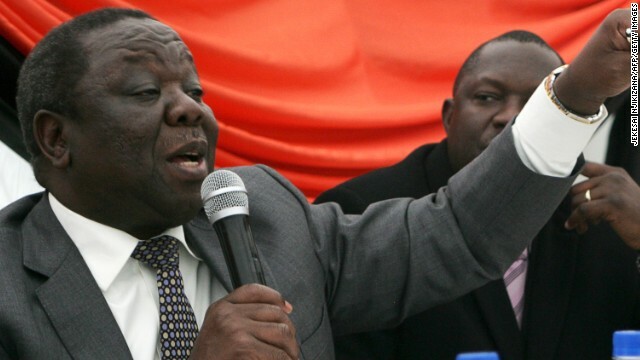 Morgan Tsvangirai was turfed out of his position as leader of Zimbabwe's opposition Movement for Democratic Change (MDC) in April, amid allegations of corruption, abuse of office, and weak leadership. His opponents said he had a taste for "big man politics". His reluctance to step down had turned him into a copy of the man he has fought so long against – Robert Mugabe. Morgan,,, lol,, the mdc has voted you out..what are you doing beimg quoted by cnn...why are you fighting to keep the govt mansion when your no longer in the govt..its time for new faces with fresh ideas leading the mdc..
Chris Black I hope you reflect on what Morgan has said and to say he must leave I hope you mean leave so that Mr Chris Black to takeover the button. Keep your hopes up but there is no reasonable justification whatsoever for your wish. Wish you luck, splinter mdc. Sarah Palin and I are going to a nice small Italian restaurant and enjoy a pepperoni pizza for dinner. Not the real palintwit @ 6:13 pm. We know palintwit, sweetie. That's a pizza troll. @ Dave is thinking productively, in my opinion. The USA gave a Revolution, and everybody came. The results were good. It was civic society in Zimbabwe that cheered and applauded MDC as the party blundered from pillar to post! D problem with african politicians is corruption, and unpatriotism coupled with an extremely selfish love of power, until that abnormal reality is corrected nothing economicaly tangible will positively have effect on every citizen. In Tsvangirai's case, he is corruption and breathtakingly incompetence! Thought you were going to"mend your ways" you said @ rupert? Or you meant to say fences? I said "...there are going to be some changes..."
"But the official results did not appear to reflect the nation’s collective will, prompting a weary shrug of the shoulders from the international community," Tsvangirai says. To start with it is not a matter of the election results did not "appear" to reflect the democratic will of the nation; they did not! Mugabe rigged the elections. The former USA Ambassador to Zimbabwe, Chris Dell (2004 to 2007) said in a WikiLeak cable to Washington that Tsvangirai was "a flawed and indecisive character". True to form; even now he still is dithering, undecided, whether the elections were rigged or not. Second, the international community shrugged their shoulders because then had warned Tsvangirai not to go ahead with the elections without implementing the reforms first but he paid no heed! The penny has yet to drop that he was to blame for the rigged elections but it is really doubtful if it will ever drop! I find it very patronizing for any one to try and argue that Zimbabweans did not know what they were doing when they voted Robert Mugabe President of the Republic of Zimbabwe on July 31 last year.Of course the electorate knew exactly what it was doing.Morgan Tsvangirai was beaten and any fool in Zimbabwe knows that the rigging allegations raised by Tsvangirai are meant to save his face.The government in power has all legitimacy.It is democratic to respect the people of Zimbabwe's choice.There are those who do not want Mugabe to be president, well, that is their choice.Not everybody in this world, or America for that matter, wants Barrack Obama as the US president.But he was voted into power nevertheless.The American people gave him a second term, warts and all, and we have to respect their choice.That's democracy. In post-election analysis, there is a danger of conflating the MDC-T's collective will and the nation's collective will in the past harmonized elections in Zimbabwe.There is a big difference between the two.Commentators often mislead readers and listeners.For example,before the harmonized elections,Tsvangirai's popularity was grossly exaggerated by local and foreign persons who were not registered voters, or if they were registered voters, they were not in the majority as demonstrated by the election results.This exaggeration to some extent lulled Tsvangirai to political sleep at the wrong time. Those who might be surprised that Tsvangirai was beaten clean by Robert Mugabe have the international media to question too.On a daily basis, except in Zimbabwe,foreign media create a false impression that Tsvangirai is the leader of a mighty and united MDC when he, in fact, is a leader of a faction called MDC-T whose membership might be a few thousand registered voters.It is preposterous for any one whose popularity is inflated in this way without noticing the inflation to have expected to beat Mugabe whose clear-cut election message based on policy considerations, rallied the electorate solidly behind his presidential candidacy. In any case, any presidential candidate who, more than once, is beaten in national elections and always blame election rigging, is still in his political diapers.Where was Tsvangirai when Mugabe was rigging elections, where was his educated lieutenants? In Zimbabwe Tsvangirai does not fool any one any more.The electorate knows him very well, and they rejected him for reasons that should be respected by the international community.The electorate knows too that he is an accomplished flip-flopper given to precipitous grandstanding as shown by his 'excellent' article above. While i agree with you on many a point, particularly the on the ilk of man that tsvangirai is and upon on his suitability (or lack thereof) as the face of change in Zimbabwe, I'm compelled to disagree with your analysis of the situation regarding the size of his "faction." The situation on the ground apparently paints a picture vastly different from your assertion. Suffice it to say the new and old splinters of the MDC "better" as they may be than his are quite lacking in momentum and grassroots support. To more serious matters, it would be in my opinion a rather dishonest statement to assert that the ground for last year's elections was level. I for one had a rather torrid experience in an extremely long queue trying to register to vote and I know a considerable number of individuals who gave up altogether because the registration process was tenuous, this all took place in an area considered to be one of tsvangirai's "strongholds". If you contrast this with the ease at which the very same process was conducted in areas such as uzumba or pfungwe you will understand my arguement. His argument regarding the electronic voters' roll are also far from unfounded. Be that as it may, there is no need to waste more breath on the elections because they are past and honestly speaking, all the ordinary person wants is a good standard of living. There is an apparent dearth of ideas within the present "legitimate" government. A year after the polls and the economy is on a steady plummet, civil servants have had their paydays postponed two months on the trot, retrenchments are on a sharp incline and so is unemployment. All the "legitimate" government is chant ZIMASSET which has thus far been as barren as the rest of their funny acronyms, when they put that to rest they bawl about "illegal" sanctions, a term which apparently very few fully understand. But alas, we still talk about legitimacy and tsvangirai, those will never be issues as long as Mugabe keeps the people in jobs with food in their bellies, clothes on their backs and money in their pockets. I respect your opinion though. What can we expect from the vanquished. You are however correct to acknowledge that Europeans and their American partners must remove their illegal economic sanctions.